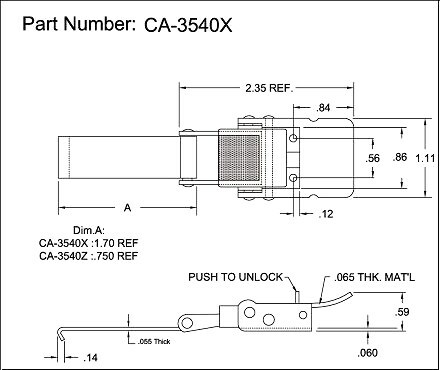 Request a quote for CA-3540Z, CA-3540X - Compression Spring Draw Latch W/ Hook - Tab Up today. JBF National latches and catches are manufactured from the highest quality materials. They are designed and tested for ultimate reliability and durability. CA-3540Z and CA-3540X is manufactured from either passivated stainless steel or clear zinc plated steel and have an ultimate strength rating of 600 Lbs. Alternate hook lengths available upon customer request. Please see component diagram below.